teen suicide is an epidemic, and the only solution is The Program. Under constant surveillance at home and at school, Sloane puts on a brave face and keeps her feelings buried as deep as she can. The only person Sloane can be herself with is James. He’s promised to keep them both safe and out of treatment, and Sloane knows their love is strong enough to withstand anything. But despite the promises they made to each other, it’s getting harder to hide the truth. They are both growing weaker. In this world, the teenage-suicide rate has skyrocketed. So much so that adults have labeled it as an out-of-control epidemic, a contagious disease that spreads from teenager to teenager. Bringing literal meaning to, "If your friend jumps off a bridge, would you do it too?" In order to control the epidemic, adults have developed and begun utilizing something called "The Program." So far, it's only in its beginning stages, which is why it only takes place in certain school districts. The teenagers who have the misfortune of going to those schools are sent to the Program if they show any signs of suicide, self-harm, or depression. All it takes, is one outbreak, one escaped tear, to get someone flagged and sent in for treatments. 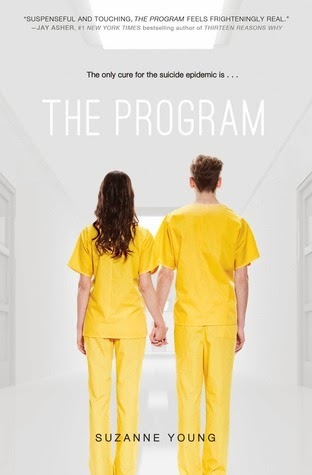 Since The Program boasts a 100% success rate in turning kids back into "normal, happy" teens who can live "normal, happy" lives, parents have become desperate enough to send their troubled teens in, no questions asked about what The Program really does. Despite the fact that government keeps any information about it under lock and key and that no visitors are permitted in the facilities, parents still ignore their misgivings and believe the best about it. Teens in this society live in constant fear of exposing their emotions. There not allowed to grieve or cry for their many lost loved ones, which makes them all the more suicidal. Many teens who are flagged choose death over the Program anyways, because they see what happens to those who enter it. They're wiped clean of memories of their friends, relationships, and anything else worth remembering. A clean slate. The characters themselves were strong independently. Sloane and James weren't one of those couples who were nothing without the other. Although Sloane did panic a bit in the beginning from having to make decisions by herself, she got over that initial shock, put on her big girl pants, and did her best to remedy the situation. She was truly a strong heroine. Not in the physical sense, but in the mental sense. You would have to be if you wanted to stay sane in a society like this. Never showing your genuine emotions? Even in front of your parents? That's a complete nightmare. Her strained conversations with her parents tore my heart into pieces. I mean, I understand why they would feel so protective of her after losing their first child, but I was still pleading, begging really, for them to listen to their daughter for a change. Although I really felt for her, there were still a couple of times when her naivete made me cringe. She trusted too easily at times, and when she did have the sense to be paranoid, she did what she was told anyways. Instead of trying to concoct a plan to get out of what she didn't want to do, she decided to live in the here and now, expressing a tiny act of defiance that would've never gotten her anywhere. James was a refreshing love interest. I really loved his personality and how he always tried his best to look after Sloane. But as all people do in reality, he had his faults and made mistakes along the way. This made him feel tangible, relatable in the everyday sense. Plus, he had a hilarious sense of humor, something that was definitely needed to temper out the dark, haunting setting these characters live in. The relationship between Sloane and James was a refreshing and unique one! By now, I'm used to reading books where the main character falls in love with a character that she meets later on in the novel or with someone she never knew she had feelings for. In The Program, she was already madly in love. The way they interacted with each other was absolutely adorable. Overall, I'm super happy for picking this up as an impulse read. Usually, I tend to stay away from books that don't involve a lot of action scenes, but this one, was a definite heart-jerker. The writing style was average. Something that I didn't notice too much, but also something that I didn't get irritated at. The theme was absolutely amazing, and I definitely give Young props for that. In a quickly overpopulating dystopian genre, Young manages to weave a chilling, eerie world that distinctly stands out above the rest. The Program makes you feel like a world as dark as this one can actually happen to us one day. A scary thought. In the next novel, I'm hoping that we'll find out more about the reason for the skyrocket in teenage suicides. There were a couple theories tossed around here and there, but nothing concrete. Can't wait! Mentally strong, a bit naive. Loved the dialogue between these two! enough to keep me thoroughly engaged. Recommend? Definitely, although you probably have to be in a certain mood to read it.